Have you noticed how good you feel after an afternoon of knitting? It’s like your ruffled feathers have all been soothed and you feel ready to take on the new week. And especially after visiting JoAnn’s. If you haven’t made it yet, it’s a must. Allow yourself plenty of time to feel, smell, cuddle, and listen to their yarns. Several are calling me now. If you have a 40% off coupon, Wednesday is the last day to use it. Hours are 9-9 Mon-Sat, 10-7 on Sunday. 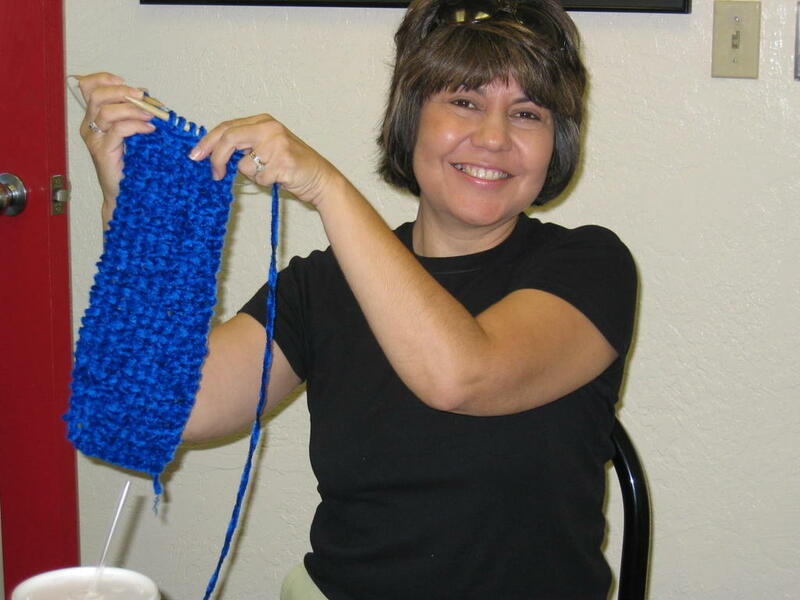 No affiliation, just a knitter who is happy they are here. They have such a great selection of yarns that you could spend hours putting together different combinations. And what a great selection for someone who is just starting to knit. 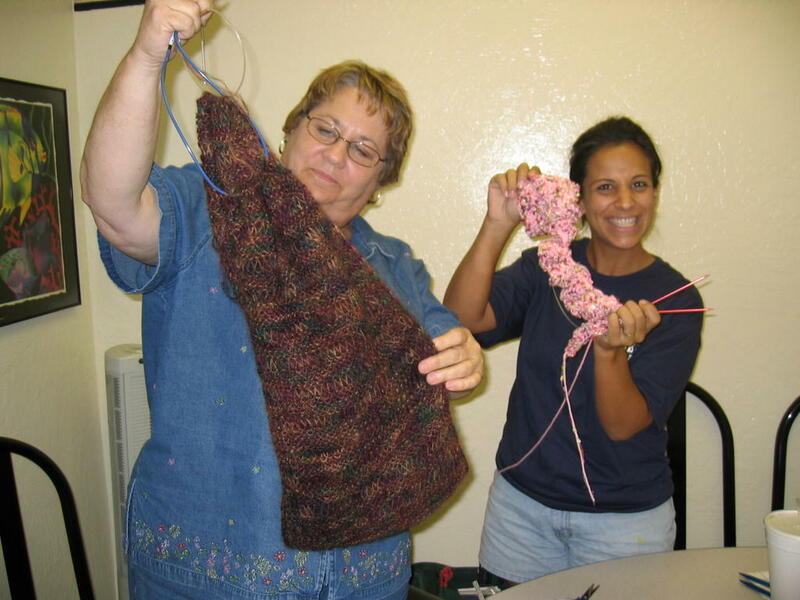 Speaking of new knitters–meet Charlene! Check out this scarf she started on Sunday out of a thick chenille. All this in just one afternoon! The chenille looks very different knitted than on the skein. It almost looks like a bobble or popcorn stitch. I heard a rumor that it is already begging to have a hat to match. Check it out next Sunday! 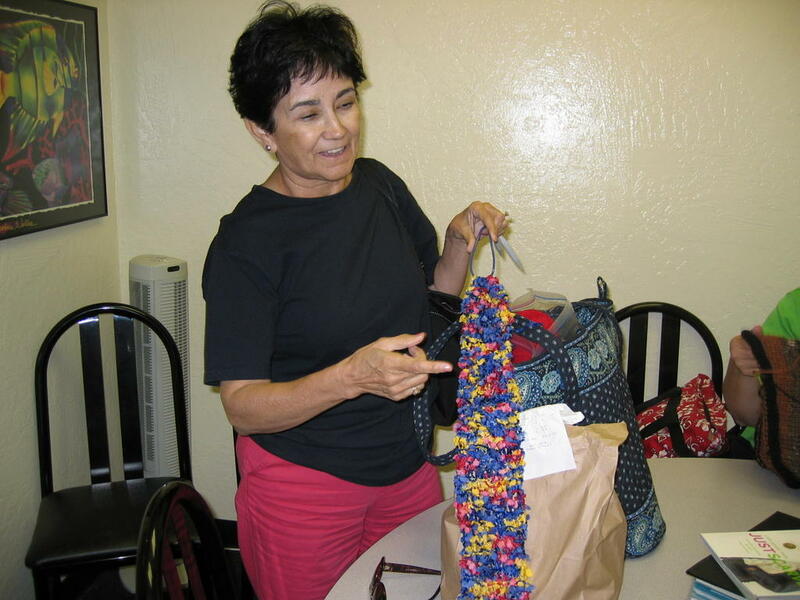 Shirley visited Unravel in Flagstaff last week and found this great yarn. It is going to grow into a poncho for a very deserving little girl who loves pink and purple. This yarn is really nice to the touch, and doesn’t feel as though it would be too warm for our climate. It is always fun to see how the colors stack in a yarn like this. Two knitters could knit the same exact same garment and they will turn out differently. It depends on your gauge, # of stitches you cast on, and your needle size. It really is fun to knit with a yarn like this, and the one in the next photo. This mystery model is giving a demo of the sock-grown-up-into-a-slipper that Linda made. I think that this is Lion Brand’s Thick and Quick yarn. It will definitely take the chill off of a cool morning. 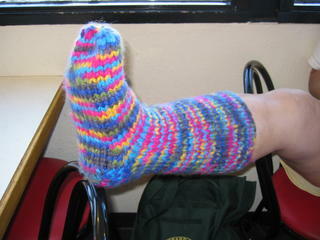 I think this is the 2nd, maybe 3rd pair that Linda has knitted? And her dye-your-own is exquisite. I apologize for not taking a photo of it. The colors are really saturated. She said that the smell of the yarn dyeing in fruity Flavor-Aid combined with the aroma of a pot roast she was cooking was almost too good to be true. Who is that mystery model??? Shirley completed her lace moebius—here is is all ready to be kitchener-stitched together. Must see and feel to appreciate! 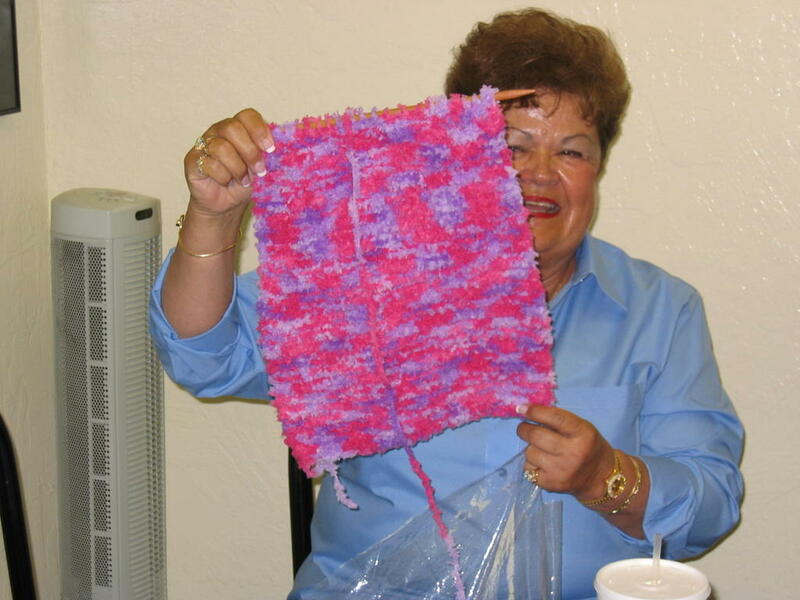 Fran is doing a poncho—I think this is new yarn from JoAnn’s? Ahhhhhhh, knitting. Sooothhhhing knitting. This is the time of year everyone starts thinking about Christmas–some of us are further along than others! 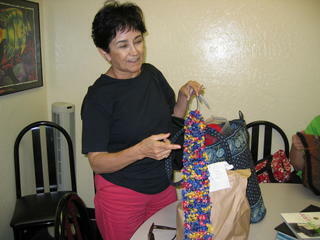 This scarf Helen is working on will undoubtedly have a hat to match and will be given to a darling granddaughter. I will publish photos of the recipients if you all will send me digital photos! That’s about it this time! I have an “uber” examen en espanol manana. I have procrastinated long enough, time to go study. See you next Sunday at Papa San’s at 1!